Composting Toilet Seat and urine diverting bowl for odourless latrine. 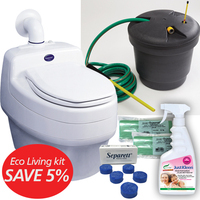 Urine separation kit with standard household seat, for use with existing latrines to provide odourless operation. 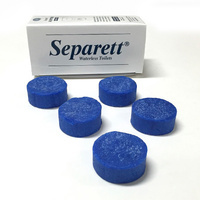 The Separett Privy 501 urine-separation kit can be easily fitted to an existing outdoor toilet, to provide odourless operation. Urine is diverted from the solids chamber, so that latrine type odours disappear and the substantially reduced solid waste is easier to deal with. 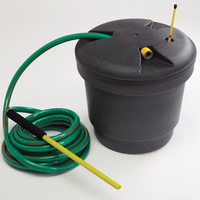 The urine is routed via a hose to a soakaway or tank, such as the Separett Ejektortank. The contents of the Ejektortank can then be used as a nitrogen fertiliser for lawns or trees. 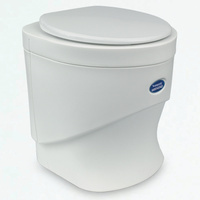 The Privy 501 comes with a standard size toilet seat and lid attached to the separating kit. 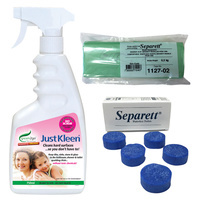 The materials are sturdy and easy to clean. Biodegradable bags for solids and paper are available as an optional extra. 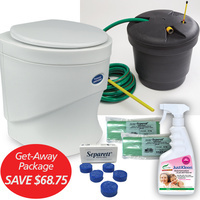 The packaging for Privy has a template that can be used to easily fit the Privy to your existing outhouse. Seat and seperator Impact resistant high gloss Polypropylene. Recyclable. White Seat; Dark Blue Seperator. 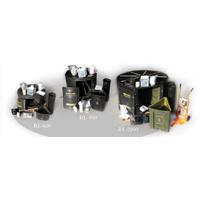 Hose 2.5m; 32mm outside diameter; 30mm internal diameter. Black.